Less to like this week than last, but a win is, in fact, still a win. Missouri offensive coordinator Dave Yost had a similar offensive game plan this year to the one Mizzou used so effectively last season in upsetting the Sooners in Columbia. He used motion and and the veer option to get OU's defense trying to read plays, rather than attacking. It definitely helped that Yost had shifty quarterback James Franklin at his disposal. The lesson, as always: If you can make OU respect your QB as a runner, your chances of success go up significantly. Don't kid yourself, because this is a big blow for the Sooners. I'll have more on this later this week, hopefully. The deal with Kenny Stills was just weird – going through warm-ups and not playing. It looked like Aaron Colvin got knocked into next week in the fourth quarter. Even if he is in next week now, I can't imagine he'll be taking the field then. Not the best evening for the defensive backs, except for always reliable Demontre Hurst. Where was Tony Jefferson? The stat sheet says he had six tackles, but I don't recall much out of him. I hate that play on third and short. Josh Heupel, on the other hand, can't get enough of it. I'll let you read them for yourself. Lewis is a dog. Flat-out legend. As is customary, the 'Stache had at least one mind-boggling interception. It's a testament, however, to how well he runs the OU offense now that Jones didn't really do anything extraordinary and still managed to throw for 450 yards. He also continues to show building confidence and composure in how he shakes off the mistakes that clearly used to waylay him. Jamell Fleming gets the pub, but Hurst is as steady as they come as a cover man. He's solid in run support, too. He plays nearly mistake-free football and is a big reason OU's secondary is one of the best in college football. Through three games, Big Frank is OU's MVP on D. Some kind of switch clearly flipped for him in the offseason, because he's finally playing like the prospect OU fans have seen in uniform the past three seasons. Damn if the Sooners didn't need him to come through, too. It wasn't long ago that I expected Reynolds was on his way out the door at OU. Yet, there he was Saturday night going for nearly 100 yards. His over-the-shoulder grab in the third quarter from Jones was a thing of beauty. 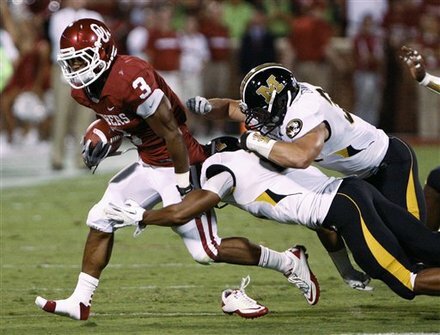 OU really needed Reynolds to play big with Stills and Trey Franks shelved. Another game, another standout performance from the walk-on running back, who had 150 total yards and a score for the game. I realize it's a policy and all to hold off on scholarships until the off-season, but come on, coach. Do you really need me to write again about how good this guy is. He also got engaged Sunday night, so congratulations are in order.